A man has been detained in Russia for opening the grave of his dead girlfriend and burning her coffin because he claimed she was stalking him in his dreams. The man, named as 30-year-old Yuriy Golovin, allegedly dug up his former lover's body five years after her death. Olga Gileva, 17, died five years ago but her boyfriend 'took advice' from a sorceress who told him to destroy her grave. 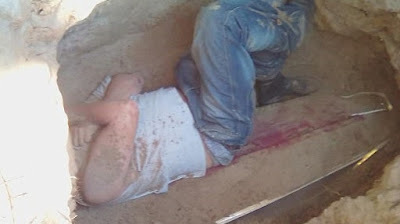 A macabre picture is believed to show him or his accomplice lying on the teenager's coffin after the grave was opened in Menschikovo village, Kurgan region, 1,075 miles east of Moscow. Detectives have also arrested a 23-year-old man over the incident and opened a criminal investigation which could lead to five year jail sentences. The disturbed grave was spotted by Oleg Ivanov, a friend of Olga's who visited the cemetery, according to reports in Russia. He then saw social media pictures showing a man lying on her coffin, possibly sleeping there. The man who posted the pictures explained that the ex-boyfriend wanted her grave dug to set fire to her remains, he said. 'He told me that he was asked by this girl's boyfriend to dig the grave,' he said. The boyfriend was 'tormented' by 'constantly seeing Olga in his dreams', according to friends. 'He want to a sorceress and was advised to get her body out of her grave and burn it,' said one account. In the event there was fire damage to the coffin but it was not fully destroyed. Local reports say Olga committed suicide by hanging herself in 2012. Olga had been an orphan, said one of her friends.